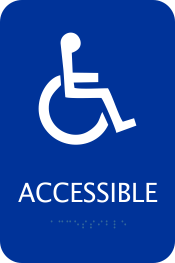 Our Handicapped ADA Sign measures 6" x 9" and features braille, meeting the ADA guidelines. This 6" x 9" Handicapped ADA sign clarifies that where this sign is placed it's handicapped accessible. This plastic sign is in compliance with the ADA as it features braille.